LIFE STORIES Scottish Polish Heritage of WWII from freshmintstudio on Vimeo. 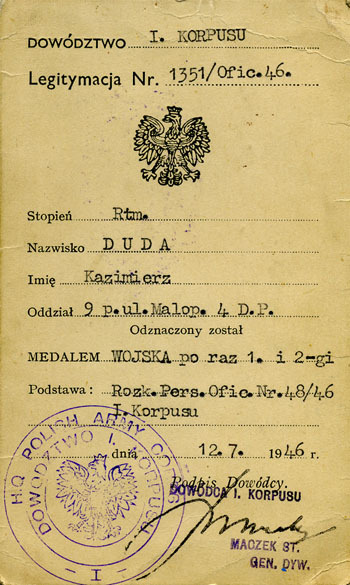 Hi, my grandfather was also in the 9th Regiment of Lesser Poland Uhlans at the start of the war. While he didn't say much about his life during the war or before it to my mother, I have found some information. Mainly that he was taken prisoner in the area of Dabrowa (some Polish researchers more or less identified that the actual battle took place just north of Wolka Weglowa) on the date of the battle (September 19th 1939). Would it be possible for you to check if Kaziemierz Duda mentioned a "Kazimierz Janowski" anywhere in his archives of the period? My grandfather's profession at the time was Barber (if that'll help). Może łatwiej będzie znaleść jeśli podam nr. legitymacji 1010/46. Vous trouverez sur ce site des photos et des documents ayant appartenu à mon grand-père Kazimierz DUDA, capitaine dans l'escadron C.K.M (szwadron Ciezkich Karabinów Maszynowych - Escadron indépendant de Mitrailleuses Lourdes) , unité faisant partie de la 1ère Division Blindée Polonaise durant le 2ème Guerre Mondiale. Ces documents sont publiés afin d'échanger des témoignages, rappeler à la mémoire et honorer tous ceux avec qui il a combattus.